Jacob Anthony deGrom (born June 19, 1988) is an American professional baseball pitcher for the New York Mets of Major League Baseball (MLB). Prior to playing professionally, deGrom attended Stetson University and played college baseball for the Stetson Hatters. DeGrom began playing baseball as a shortstop and was converted into a pitcher during his junior year at Stetson. The Mets selected him in the ninth round of the 2010 MLB Draft, and he made his MLB debut with the Mets on May 15, 2014. That year, deGrom was named the National League's (NL) Rookie of the Month twice, and the NL Rookie of the Year. In 2015 and 2018, deGrom was selected as an MLB All-Star. In 2018, deGrom was the NL ERA leader and won the Cy Young Award. On April 7th, 2019 deGrom was awarded with his Cy Young Award by Mets GM Brodie Van Wagenen and Mets manager Mickey Callaway. He also received a single first-place vote for National League MVP being the only player besides Christian Yelich to do so. After going unselected in the Major League Baseball (MLB) draft out of high school, deGrom enrolled at Stetson and played for the Hatters. He was exclusively a shortstop during his freshman and sophomore seasons. Though he was considered a good fielder with a strong throwing arm, deGrom was a light hitter, with a career .263 batting average. He made his first appearance as a pitcher in May 2009. 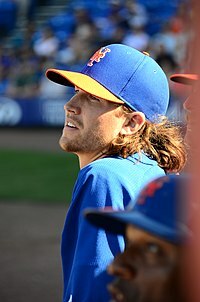 In the summer of 2009, between his sophomore and junior years, deGrom received an invitation to play collegiate summer baseball for the DeLand Suns of the Florida Collegiate Summer League, which he declined after discovering that they wanted him to play as a pitcher. When deGrom returned to Stetson that fall, the team used him as a relief pitcher, filling the role of their closer, in addition to playing shortstop. He quickly became one of Stetson's best pitchers, so the team moved deGrom into their starting rotation midway through the season. In addition to a fastball, deGrom learned to throw a changeup and a slider. MLB scouts began to take notice of deGrom when he pitched against Chris Sale of Florida Gulf Coast University. In that game, deGrom hit his only home run of the season against Chris Sale. He made 12 starts for the Hatters, pitching to a 4–5 win–loss record with a 4.48 earned run average. DeGrom compiled four quality starts in his first four MLB starts, but did not record a win in any of them. On July 8, deGrom pitched seven scoreless innings and recorded 11 strikeouts in giving the Mets their 4,000th franchise victory. Along with Steve Cishek of the Miami Marlins, deGrom was named the National League's (NL) Co-Player of the Week for the period of July 21 to 27 after allowing only one earned run in two starts that week. He was named the NL Rookie of the Month for July. On August 11, deGrom went on the disabled list with rotator cuff tendinitis. Rafael Montero was called up on August 12 in deGrom's place. On August 23, Montero was re-sent back to the 51s to make room for deGrom coming off the disabled list. DeGrom and Clayton Kershaw of the Los Angeles Dodgers were selected as NL Co-Players of the Week for the week ending June 7, 2015. He began the 2015 season with an 8–6 win-loss record and a 2.30 ERA through the end of June, and was named to the NL roster in the 2015 MLB All-Star Game. During the All-Star Game, deGrom struck out the three batters he faced on ten pitches, becoming the first person to do so since pitch counts were recorded. DeGrom pitched to a 14–8 record with a 2.54 ERA and a 0.99 walks plus hits per inning pitched ratio during the 2015 season. Following the season, deGrom received a Wilson Defensive Player of the Year Award as the best defensive player statistically at his position in Major League Baseball. He also placed seventh in Cy Young Award voting. DeGrom initially refused to sign the 2016 contract for the $607,000 salary assigned to him. Not yet eligible for salary arbitration, deGrom was bound by the MLB Collective Bargaining Agreement to accept the salary assigned to him by his club. He eventually relented and reluctantly capitulated to signing his contract early in spring training. On July 17 at Citizens Bank Park in Philadelphia, deGrom pitched a complete game shutout against the Philadelphia Phillies, allowing only one hit and one walk while striking out seven opposing batters. His game score of 97 was tied for second-best in Mets history in a nine-inning game. DeGrom's final pitching appearance of the season came on September 1, when he faced the Miami Marlins. He underwent season-ending surgery on his ulnar nerve in late September in order to relieve discomfort in his elbow and numbness in his fingers which had plagued him during the 2016 season. Eligible for salary arbitration for the first time, deGrom and the Mets avoided an arbitration hearing by agreeing to a salary of $4.05 million for the 2017 season. On June 18, 2017, deGrom hit his first career home run at Citi Field against Joe Ross of the Washington Nationals. deGrom was named NL Player of the Week for the week of June 12–18 after hitting his first home run, posting a 0.53 ERA, allowing eight hits, striking out 12 and walking six in 17 innings over two starts. deGrom recorded wins in eight consecutive starts from June 12 until July 24, tying a franchise record previously set by Seaver, David Cone and Bobby Jones. deGrom recorded the first stolen base of his career on August 4 off of Yu Darvish and Yasmani Grandal of the Dodgers. He became the first Mets pitcher to steal a base since Óliver Pérez in 2008. Of the seven potential starting pitchers who began the season with the Mets, deGrom was the only one who finished the 2017 season without spending any time on the disabled list. deGrom finished the 2017 season with a record of 15-10 and a 3.53 ERA. deGrom finished eighth in voting for the 2017 NL Cy Young Award. DeGrom and the Mets agreed on a $7.4 million salary for the 2018 season. On May 6, the Mets placed deGrom on the 10 day disabled list, retroactive to May 3, with a hyperextended pitching elbow. deGrom had suffered the minor injury while batting during his May 2 start against the Braves. Owning a MLB-leading 1.68 ERA, deGrom was named to the 2018 Major League Baseball All-Star Game. During the All-Star Break, Brodie Van Wagenen, deGrom's sports agent, called for the Mets to engage in contract extension talks, or to "seriously consider trade opportunities now". On September 3, deGrom tied an MLB record by completing his 25th straight start allowing three or fewer runs. DeGrom recorded his 1,000th career strikeout in his final start of the season on September 26 at Citi Field. DeGrom finished the season 10-9 with a 1.70 ERA, which led the majors and was the third-lowest of any pitcher with 30 starts in a season since MLB lowered the mound following the 1968 season. For the 2018 season he led the majors in lowest home runs per nine innings (0.41). On November 14, deGrom was announced as the National League Cy Young Award winner; he received all but one first place vote. His 10 wins were the fewest in history by a Cy Young Award-winning starting pitcher. DeGrom finished fifth in the National League Most Valuable Player voting and was the only player other than award winner Christian Yelich to receive a first place vote. During the 2018-19 offseason, the Mets hired Van Wagenen as their general manager. DeGrom and the Mets agreed to a $17 million salary for the 2019 season, the largest annual raise ever for an arbitration-eligible player. With Van Wagenen now negotiating for the Mets rather than deGrom, the two sides agreed to a five-year, $137.5 million contract extension with an option for the 2024 season during spring training in 2019. DeGrom started for the Mets on Opening Day against Max Scherzer, the 2018 Cy Young Award runner-up to deGrom and the 2017 Cy Young Award winner. DeGrom set a career high in strikeouts in his next start on April 3 with 14. DeGrom is from DeLeon Springs, Florida. He was raised by his parents, Tony, an AT&T lineman, and Tammy, a customer service representative for a credit card rewards program. Tony built a batting cage in the backyard for his son to practice. He credits his father for his quiet intensity and humility. He is the youngest of three children of Tony and Tammy; his sisters are named Sarah and Jessica. Shortly after graduating from high school, deGrom met his wife, Stacey. They were married in November 2014, and live in DeLand, Florida. They have a Morkie, and had their first son, Jaxon, in April 2016. Their second child, a daughter named Aniston, was born in February 2018. At Stetson, deGrom began to grow out his hair. His starts with the Mets led to the trending hashtag on Twitter of "#hairwego". 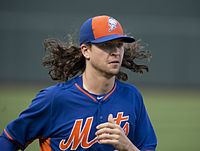 His hair inspired a promotional "Jacob deGrom Hair Hat" giveaway at Citi Field during the 2016 season. 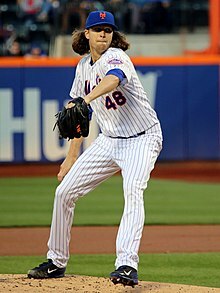 After learning that an unnamed MLB hitter said that deGrom's hair made it harder to pick up the ball out of his hand, deGrom said in 2016 that he would never cut his hair. However, he cut his hair during the 2017-18 offseason, saying that doing so could add speed to his fastball, and also that he was tired of having long hair. DeGrom is close friends with fellow Mets starting pitchers Zack Wheeler, Steven Matz, and Noah Syndergaard. ^ Ryan, Dan (January 13, 2007). "Lighthouse holds off Calvary". Orlando Sentinel. Retrieved June 12, 2010. ^ "Class 1A, 2A All-State Baseball". Naples News. June 14, 2007. Retrieved June 8, 2010. ^ a b c d e f g Vorkunov, Mike (May 21, 2014). "Mets rookie starter Jacob deGrom went from light-hitting shortstop to major league pitcher". The Star-Ledger. Retrieved September 22, 2014. ^ a b c d Gardner, Sam (November 12, 2014). "Small school Stetson produces AL Cy Young, NL Rookie of the Year". FOX Sports. Retrieved May 11, 2015. ^ Gilmore, Roger (May 11, 2009). "UCF here for Stetson Hats' Sr. Night". West Volusia Beacon. Retrieved July 11, 2015. ^ a b c d e f Kerber, Fred (August 1, 2014). "How Jacob deGrom went from light-hitting SS to Mets stud pitcher". New York Post. Retrieved September 22, 2014. ^ a b Driver, David (June 18, 2013). "EL notes: deGrom gets acclimated | MiLB.com News | The Official Site of Minor League Baseball". Milb.com. Retrieved August 27, 2013. ^ a b c d e f g h Rohan, Tim (May 21, 2014). "A Mets Rookie's Hair and Profile Grow". The New York Times. Retrieved September 22, 2014. ^ Altman, Howard (March 25, 2015). "Reigning Rookie of the Year Jacob deGrom Makes His Pitch for Greatness". New York Observer. Retrieved July 9, 2015. ^ a b Dewey, Todd (April 20, 2014). "51s' deGrom bouncing back from injury that's literally 'no bull' story". Las Vegas Review-Journal. Retrieved September 22, 2014. ^ Vorkunov, Mike (March 23, 2014). "As Tommy John surgery remains vexing issue, Mets' rebuild is guided by approach to preserve young pitchers". The Star-Ledger. Retrieved September 22, 2014. ^ a b Rubin, Adam (July 10, 2014). "Farm report: Ex-fielder deGrom makes pitch". ESPN.com. Retrieved September 22, 2014. ^ Puma, Mike (July 12, 2013). "Jacob deGrom, New York Mets pitcher, turning heads at Triple-A Las Vegas". New York Post. Retrieved August 27, 2013. ^ DiComo, Anthony (November 20, 2013). "Mets shield former top pick Matz from Rule 5 Draft". MLB.com. Retrieved December 14, 2013. ^ a b Rubin, Adam (May 12, 2014). "deGrom gets big-league call, too". ESPN.com. Retrieved May 12, 2014. ^ Rumberg, Howie (May 15, 2014). "Stetson product Jacob deGrom has memorable debut in majors". The Daytona Beach News-Journal. Associated Press. Retrieved September 22, 2014. ^ Hutchinson, Dave (May 16, 2014). "Mets starter Jacob deGrom impresses in major-league debut". The Star Ledger. Retrieved September 22, 2014. ^ Simon, Mark (June 5, 2014). "DeGrom showing command, composure". ESPNNewYork.com. ESPN Internet Ventures. Retrieved September 22, 2014. ^ Healey, Tim (July 9, 2014). "Mets become 20th club to reach 4,000-win plateau". MLB.com. Retrieved August 17, 2014. ^ "Steve Cishek of the Miami Marlins and Jacob deGrom of the New York Mets named the National League Co-Players of the Week". MLB.com. Retrieved May 1, 2015. ^ Rubin, Adam (August 4, 2014). "deGrom named NL Rookie of Month". ESPN. Retrieved August 4, 2014. ^ "Jacob deGrom to DL, Rafael Montero to start Tuesday". SNY. Retrieved December 27, 2015. ^ Chris McShane (August 23, 2014). "Mets option Rafael Montero to Las Vegas". Amazin' Avenue. Retrieved December 27, 2015. ^ Rubin, Adam (September 16, 2014). "Jacob deGrom strikes out first 8". ESPN New York.com. Retrieved September 16, 2014. ^ "Jacob deGrom of New York Mets will skip final start – ESPN New York". ESPN.com. Retrieved October 21, 2014. ^ "Sporting News names Mets' deGrom top rookie". New York Post. October 21, 2014. Retrieved October 21, 2014. ^ "2014 MLB Rookie of the Year – Jacob deGrom of New York Mets named NL winner". ESPN.com. Retrieved May 7, 2015. ^ "Jacob deGrom of the New York Mets and Clayton Kershaw of the Los Angeles Dodgers named National League Co-Players of the Week" (Press release). Major League Baseball. June 8, 2015. Retrieved July 10, 2015. ^ Puma, Mike (July 6, 2015). "Mets' deGrom gets All-Star nod, but Familia's fate unknown". New York Post. Retrieved July 9, 2015. ^ Rubin, Adam (July 14, 2015). "Jacob deGrom strikes out side in All-Star Game". ESPN.com. Retrieved July 16, 2015. ^ Vorkunov, Mike (October 3, 2015). "Mets to start Jacob deGrom in NLDS Game 1 vs. Los Angeles Dodgers". NJ.com. NJ Advance Media. Retrieved October 4, 2015. ^ Svrluga, Barry (October 10, 2015). "DeGrom, opposite Dodgers' Kershaw, strikes out 13 in Mets' Game 1 NLDS win". The Washington Post. Retrieved October 20, 2015. ^ Harris, Beth. "Murphy, Mets beat sleeping Dodgers 3–2 to reach NLCS vs Cubs". Yahoo! Sports. Retrieved October 16, 2015. ^ Tayler, Jon (October 20, 2015). "Murphy, deGrom push Cubs to the brink with NLCS Game 3 win". SI.com. Retrieved October 20, 2015. ^ "MLB Baseball Box Score - New York vs. Kansas City - Oct 28, 2015 - CBSSports.com". CBSSports.com. ^ Vorkunov, Mike (November 11, 2015). "Mets' Jacob deGrom wins Defensive Player of the Year award". NJ.com. Retrieved April 8, 2016. ^ "Cubs' Jake Arrieta wins 2015 NL Cy Young". bbwaa.com. November 18, 2015. Retrieved August 20, 2018. ^ Rohan, Tim (March 4, 2016). "Mets' Jacob deGrom Reluctantly Accepts $607,000 Salary for 2016". The New York Times. Retrieved February 15, 2017. ^ Giglio, Joe (July 18, 2016). "5 stats summing up Mets' Jacob deGrom's dominance". NJ.com. Retrieved February 15, 2017. ^ Rubin, Adam (September 20, 2016). "Season over for deGrom as nerve surgery looms". ESPN.com. ESPN. Retrieved February 15, 2017. ^ Wagner, James (January 13, 2017). "Mets Sign Six, Including Jacob deGrom and Matt Harvey, to One-Year Deals". The New York Times. Retrieved February 26, 2018. ^ DiComo, Anthony (June 18, 2017). "deGrom helps himself, smacks 1st career HR". MLB.com. Retrieved June 19, 2017. ^ Laymance, Austin (June 19, 2017). "Mets' Jacob deGrom named NL Player of Week". MLB.com. Major League Baseball. Retrieved June 19, 2017. ^ Wagner, James (July 25, 2017). "Jacob deGrom Is Alone Among Mets Starters: Uninjured and Unbeatable". The New York Times. Retrieved November 18, 2017. ^ Clements, Ron (August 4, 2017). "WATCH: Jacob deGrom swipes first career stolen base against Yu Darvish". Sporting News. Retrieved December 20, 2017. ^ Ackert, Kristie (September 30, 2017). "Jacob deGrom scratched from final start of season". NY Daily News. Retrieved November 18, 2017. ^ Kepner, Tyler (November 15, 2017). "Max Scherzer and Corey Kluber Win Cy Young Awards". The New York Times. Retrieved November 18, 2017. ^ a b Puma, Mike (January 26, 2018). "Jacob deGrom's world: Short hair and a short deal". New York Post. Retrieved February 26, 2018. ^ Kerber, Fred (May 6, 2018). "'Cautious' Mets change their mind on DL'ing Jacob deGrom". New York Post. Retrieved May 6, 2018. ^ Braziller, Zach (July 16, 2018). "Jacob deGrom's agent goes off on Mets: Pay him or trade him". Nypost.com. Retrieved March 27, 2019. ^ "Jacob deGrom ties MLB record with 25th straight start allowing three or fewer runs". ESPN. September 4, 2018. Retrieved September 5, 2018. ^ a b Acquavella, Katherine (September 27, 2018). "Jacob deGrom finishes one of the best pitching seasons in history by earning 10th win". CBSSports.com. CBS Sports. Retrieved November 17, 2018. ^ Healey, Tim (November 14, 2018). "Jacob deGrom wins NL Cy Young in landslide vote". Newsday. Retrieved November 17, 2018. ^ Boeck, Scott (November 14, 2018). "Mets ace Jacob DeGrom named NL Cy Young winner despite just 10 wins". USA Today. Retrieved November 27, 2018. ^ Barstow, Anthony (November 16, 2018). "Jacob deGrom gets NL MVP vote to prevent unanimous winner". New York Post. Retrieved November 17, 2018. ^ Acquavella, Katherine (October 30, 2018). "Mets, new GM Brodie Van Wagenen address potential conflicts of interest with deGrom, others". CBSSports.com. Retrieved March 27, 2019. ^ "New York Mets, Jacob deGrom agree to $17 million, 1-year contract". Espn.com. January 11, 2019. Retrieved March 27, 2019. ^ "Jacob deGrom, Mets agree to five-year, $137.5 million extension". Usatoday.com. Retrieved March 27, 2019. ^ Joyce, Greg (January 1, 1970). "How the Mets and Jacob deGrom were able to hammer out a deal". Nypost.com. Retrieved March 27, 2019. ^ Armstrong, Kevin (April 3, 2019). "Jacob deGrom Dominates Marlins on the Mound and at the Plate". The New York Times. ISSN 0362-4331. Retrieved April 5, 2019. ^ Gilmore, Roger (May 24, 2010). "The Stetson Hatters are in!". West Volusia Beacon. Retrieved July 11, 2015. ^ a b "Pair of Aces". Tumblr. New York Mets. May 11, 2015. Retrieved May 11, 2015. ^ Kernan, Sean (June 18, 2014). "Mets pitcher, ex-Stetson star Jacob deGrom going with the flow". The Daytona Beach News-Journal. Retrieved September 22, 2014. ^ Serby, Steve (April 11, 2015). "Jacob deGrom on his flowing locks, his honeymoon and the playoffs". New York Post. Retrieved October 28, 2015. ^ Kernan, Sean (October 5, 2014). "Mets' deGrom returns to the hill for Stetson, 'where it all started'". The Daytona Beach News-Journal. Retrieved July 9, 2015. ^ Popper, Daniel (April 13, 2016). "Mets Insider: deGrom, whose son was born, will not go on DL". New York Daily News. Retrieved April 13, 2016. ^ "Jacob deGrom and wife, Stacey, welcome baby girl". SNY. February 22, 2018. Retrieved March 31, 2018. ^ Fleming, Kirsten (August 1, 2015). "You'll never guess who styles Jacob deGrom's hair". New York Post. Retrieved October 28, 2015. ^ Shark, Shannon (April 6, 2016). "Mets giving away Jacob deGrom Hair Hats in September". Mets Police. Retrieved September 21, 2016. ^ Klapisch, Bob (March 2, 2016). "Klapisch: Mets staff has an ace, or three, up its sleeve". NorthJersey.com. Retrieved September 21, 2016. ^ Kernan, Kevin (February 13, 2015). "This 'hard to catch' Mets lefty can be their next deGrom". New York Post. Retrieved May 25, 2017. ^ "DeGrom 'honored' by high hopes for staff". Newsday. Retrieved May 25, 2017.